Yarri Kamara, after reading James Tumusiime’s What Makes Africans Laugh and Jennifer Makumbi’s Kintu back to back, reviews them comparatively in this essay on the importance of identifying and owning our stories and heritage as Ugandans and then as Africans. The imaginary of many an African today has many gaps. As such, it may be easier for some Ugandans to conjure up images of antebellum America, thanks to their diet of popular TV series and novels, than to imagine what life in 18th century Buganda was like. 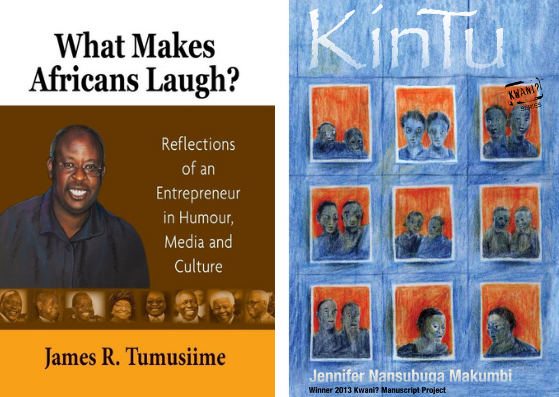 Following a short trip to Uganda in 2018, I happened to read two Ugandan books back-to-back: the memoirs of James Tumusiime, a self-styled cultural entrepreneur (published in 2013), and what is surely a seminal novel for Uganda, Jennifer Makumbi’s Kintu (first published in 2014 and released in the UK in 2018). The latter provided the answer to the questions raised in the former. Tumusiime’s book, somewhat incongruously titled What makes Africans laugh?, is a plaintive reflection on the plight that faces Africa’s identity in cultural, literary and heritage production. “Why are Africans not telling their stories?”, asks the author repeatedly. Kintu is a novel that with poise and assurance places Uganda’s culture and history on the stage of world literature. Tumusiime’s book opens with a Senegalese proverb: “If you borrow a man’s legs, you will go where he directs you”. The description of his childhood in Western Uganda concretely illustrates how the African imaginary was occupied by foreign influences, particularly through religion. We see Ankole cultural practices vanishing (and being devalued) to be replaced by Christian and Western practices under colonialism. Tumusiime and his siblings were “denied many of the pleasures that defined traditional village life [including traditional songs], because many of them had been signed off as evil” by new Christian converts. When he starts his schooling, he receives “instruction from an all-white teaching staff”, and this largely remains the case until the end of his secondary school career. As he describes his youth, we find some answers to the author’s central frustration over “why Africans do not write their own stories, their own histories, their own cultures”. Recalling the mobile cinema shows that provided entertainment to villagers, Tumusiime notes that “local material was totally missing”. On his “borrowed legs”, Tumusiime was drawn to socio-political commentary on distinctly African realities. He achieved fame as a cartoonist during the Amin times and later served as founding manager of one of Uganda’s leading dailies, The New Vision. His experiences gradually instilled a desire to create a platform for African stories to be told and he founded the publishing house, Fountain Publishers. Drawn to servicing the school textbook market for financial survival, Tumusiime had to fight the quasi-monopoly of publishing houses from the former colonial power on educational publishing – a battle familiar to several African countries. Tumusiime’s relative successes in publishing did not entirely satisfy his cultural quest. He ventured into local language radio broadcasting to build bridges with the non-English speaking masses and revitalize local languages. Finally, his quest led him to establish Igongo Cultural Centre, a complex which includes a museum, for “a nation without a past is a lost nation, and a people without a past is a people without a soul”. This attempt to instil in Ugandans the confidence to “influence the world with [their own] ideas in art, science and culture” was met with backlash from some religious leaders in the region: “We need to be wary of [Tumusiime]: he’s bringing back witchcraft”, they warned. Those leaders, and others under the tight grip of exclusionary versions of Christianity, would perhaps not delight in Makumbi’s Kintu where traditional Ugandan modes of spirituality and myths of origin take centre stage. Firmly rooted in a Ugandan cosmology, Kintu like all great stories is crafted in a way that speaks to the whole world. The book has received several rave reviews from African and international media press outlets such The Guardian and New York Review of Books. Makumbi also won the prestigious Windham-Campbell literary prize worth USD 165,000. Tumusiime and others disheartened by the cultural scene in Africa can take heart particularly in the fact that Kintu was first published by the Kenyan publishing house Kwani?, after Makumbi’s manuscript won Kwani?’s 2012 manuscript competition. It was from this African platform that Kintu grew to worldwide fame. Kintu is a sweeping family saga that follows the travails of Kintu, the common ancestor to the book’s main characters, in the 18th century Buganda kingdom. The story then jumps forward to contemporary Uganda presented through the lives of four of Kintu’s descendants. For someone who spent part of her childhood in Uganda, what is remarkable about this book are the detailed descriptions of life in 18th century Buganda, which render much better parts of Ugandan history than any visit to the under-funded and somewhat under-inspired Uganda Museum could. The first part of the book also contains a unique exploration of masculine sexuality in a traditional African society and a surprising reflection on the sometimes-crushing weight of polygamy and high pro-natalist expectations on men. The rest of the book skilfully offers a rich panoply of today’s Ugandan experience. With an eye for the absurd, reminiscent of some of Salmon Rushdie’s work, Makumbi’s memorable line-up of characters includes the holier-than-thou Kanani and Faisi. This fanatically religious couple who ascribe to the Awakened Christian church have as their mission in life to evangelise the “Asleep”. Fired by their faith and so focused on keeping themselves free of contamination by heathens, the couple is carelessly oblivious to what is happening to their offspring under their own roof. They wilfully cut ties with the larger family who do not ascribe to their religious asepsis, and disdainfully refute local customs, such as giving their twin children the traditional names reserved for twins. Then there is Miisi, the Western-educated intellectual who while at Cambridge excited his supervisor with his proposed research theme on “The Centrality of Bloodletting to Religious Practice”. His British supervisor advised Miisi to focus on human sacrifice in African pagan worship, “but Miisi wanted to focus on Christ and Isaac”. In one wry phrase, Makumbi turns the exoticizing lens so often focused on Africa, on Western icons considered standard global heritage. After his intellectual escapades in the UK, Miisi returns to Uganda and after a while, disillusioned with university life, retreats to rural Uganda. From there, he attempts to bring enlightenment to his fellow villagers through debates. It is he who offers one of the book’s most poignant and incisive images, which echoes the Senegalese proverb that opens Tumusiime’s book. Debating with villagers on the effect of colonisation, Miisi conjures up the image of a Frankenstein Africa, that he renders under the Luganda concept ekisode. In his allegory a surgeon lulls Buganda (and the rest of Africa) to the operating table with promises of speeding up its maturity. Once Africa is under chloroform, the surgeon decides to cut off its limbs and graft European legs on the African torso. In the meantime, the European moves into Africa’s house. When Africa awakes, groggy and weak, it sees that it is hideous; Africa’s body rejects the European body parts, but time cannot be turned back. This process of evolution of Africanstein into a new wholesome form of course requires African cultural production, be it in literature, film or social commentary. While all is not rosy in the environment for African cultural production, it is encouraging that the crucial concerns that Tumusiime raised in his 2013 book, found a resounding response in Makumbi’s phenomenal book in 2014. West African authors have long been populating the African imaginary; increasingly East African authors are also resettling their imaginary, so long rendered barren by zealous Christianization. An aside to African filmmakers out there who have not yet read Kintu: the book, with its six-novella format, is practically begging to be adapted into a TV series. Had never thought of the two books in contextual support of each other. This provokes me to think of a number of book titles. I read KINTU and the scenarios have not left my head. A good layout of typical events in Buganda traversing from 19th century to-date. An awesome read!! !